“Diversity” is the word that best defines the people who study in Terracentro Spanish School. The school is conscious that the atmosphere of the institution and the opportunity you have to practice the language with other people , meet new friends and get to know about different cultures is very important when you make your choice to study. In the school you are going to find people from all over the world. Ecuador is a country that receives hundred of tourists each year generally from North America, Europe, Asia, Australia and Brazil. You will find in the school travelers who chose Ecuador to learn Spanish before they start their travels in South America, volunteers who have come here to get to know the country reality, students who are here to fulfill internships and need the language for their jobs, and professionals who are going to spend years in Ecuador working in Ecuadorian international high schools, universities, multinational companies, etc. You will find here an interesting group of people with whom to share the classroom and to get to know during our daily breaks and schools activities. We want our students to feel the Latin culture in the school. The relationship that the students have with their teachers and the director is excellent. 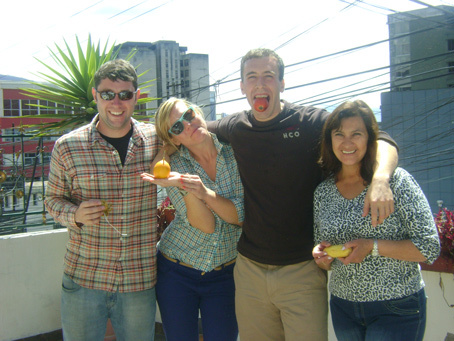 Students always feel free to ask us for further information about the school or life in general in Ecuador, or just have someone to share traveling experiences or different point of views during the coffee-breaks. We invite you to join this family! !